1935 Ford Pickup Modified all Steel Truck-w/260 HP V8 Mustang Motor & Top Loader 4-Speed Manual Transmission, Duel Exhaust, New Rack & Pinion Steering, Independent Front Suspension & Front Disc Brakes. New Pete & Jake Pedals w/ Hydraulic Clutch. MD Alloy Classic Wheels w/ Sumitomo 17” Tires (1,000 Miles on them) plus Tinted Windows. The modification on the Truck was professionally done in 1992. 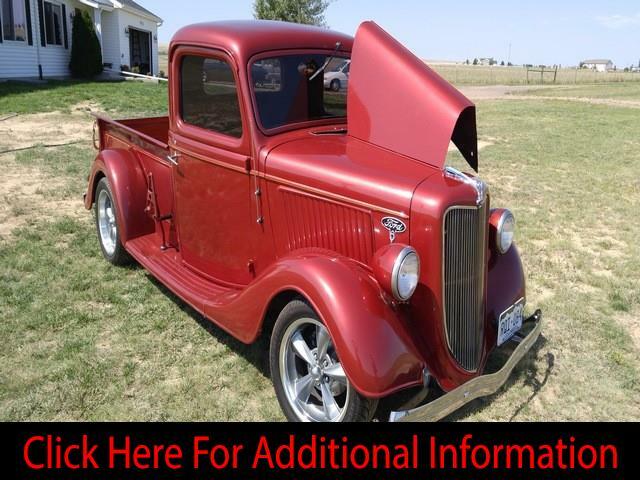 The owner at the time was a professor at Colorado State University who happen to be born in 1935 and loved older Ford Trucks so he spared no costs in the rebuilding of this truck. The current owner has made some additional modifications mostly by beefing up the Frame for a smoother ride and rebuilding the suspension. Be sure to notice the extended front window option in the pictures along with the detail to the front grill-All Chrome! The interior is exceptionally well done with upgraded Gauges, Cloth & Vinyl Seat and Cloth Headliner. If you have a love for old Ford Trucks than this one is a “must see”. Message: Thought you might be interested in this 1935 Ford Model 50.